Beat This Caption Contest 52 Winner – Caption Contest Funny Clever Witty Enter Today! 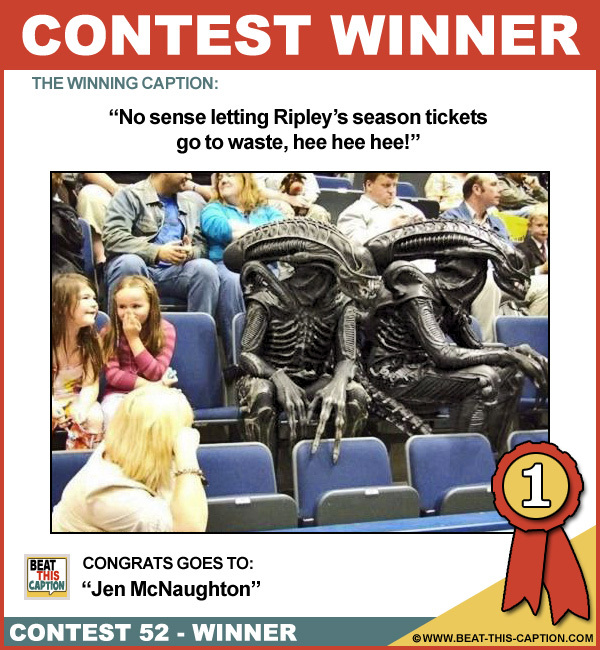 No sense letting Ripley’s season tickets go to waste, hee hee hee! Will the owner of the black spaceship please return to the parking lot; your lights are on! Look at that blonde over there – I wouldn’t mind bursting out of HER stomach! I’m no longer seeing Mary..I broke her heart! You dork, this doesn’t look like Comic Con to me! The corn dog was O.K., but I didn’t like the batter, he tasted awful! Why are they calling us dickheads! Keep my seat I need to do a pod! One man’s game is another man’s smorgasbord, I always say! I love it when Alien Rodriguez gets up to bat!